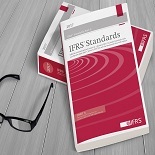 We are pleased to let you know that the 2017 IFRS®Standards (Red Book) is now available to buy. This is the only official printed edition of the consolidated text of the International Accounting Standards Board's authoritative pronouncements as issued at 1 January 2017. IFRIC® Interpretation 22 Foreign Currency Transactions and Advance Consideration. Be the first to order a printed copy and find out more information on its content on our IFRS Shop. The 2017 IFRS Standards (Red Book) is also available as a PDF download or as a Bundled product including the download and the printed copy. eIFRS Comprehensive Subscribers and eIFRS Professional subscribers are able to access the book electronically on eIFRS.